Want to play MP4 on iPod? You’re not lucky if your MP4 files are not encoded with the only supported MPEG-4 or H.264 codecs. You can drop it to your iPod and have a trial. If no avail, you need an MP4 to iPod video converter to do the tricks. Fortunately, there are many MP4 to iPod converter programs on the market. What you should pay attention to is the fully support for MP4 file format because MP4 is just the container format, which virtually can hold any codec. Last, the conversion speed is also important. Sometimes it takes like the same long time as just watching the MP4 video. No worry. Here we will tell you how to solve MP4 to iPod playback issue easily. 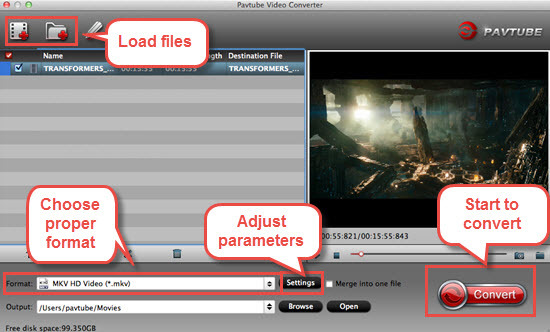 Pavtube Video Converter for Mac is the very MP4 to iPod converter you can count on. It not only fully supports all MP4 files. No matter what the codecs is used inside. If your iPod doesn’t support video, or the MP4 files are audio only (yes, it’s possible), just convert audio from MP4 video to a common audio format MP3 or M4A so that you can easily enjoy them without any hassle. For Windows users, here is the Windows version. Convert MP4 to iPod supported video with 3 easy steps. Convert MP4, MKV, MOV, FLV, AVCHD, MXF, XAVC, MPG etc to iPod. Convert FLAC, AAC, AC4, MP3 etc audio to iPod supported audio and video. Provide output formats for iPod, iPad, iPhone, Apple TV, iMovie, FCP etc. Edit MP4 with some basic editing video functions. Compatible with macOS 10.12 Sierra, 10.11 El Capitan, 10.10 Yosemite, 10.9 Mavericks…..
Now follow the three steps to convert MP4 to iPod supported video. Simply drag and drop MP4 files to the main interface of MP4 to iPod Converter. Click “Format “drop-down button to select “MP4″ from “Video” or “HD Video” category under “Format”. You also can choose other iPod popular formats form “iPod”. Just click “Start” button of MP4 to iPod to finish MP4 to iPod Conversion with high quality and fast speed. When done, click “Open” button and you’ll see the converted MP4 files there. Now start to play MP4 in iPod. Click “Setting…” button on the interface, and a window will pop up which allows you to set the bitrate of the video and audio, adjust the codec and change the channel of the audio, etc. How to transfer videos for playback on iPad, iPod, and iPhone? WD TV Won’t Play All MP4 Files, Solved! How to Get MP4 Files Played on DVD Player from USB Port?